It’s hard to blame Lindy Ruff for changing things up a bit, especially with his club on a four-game losing streak. That’s why the Dallas Stars head coach opted to have morning skate on Friday morning in advance of their game with the New York Rangers at Madison Square Garden, which is not customary practice, especially since Dallas was on the second night of a back-to-back. And to their credit, the Stars played much better than they did in losses at the New York Islanders and New Jersey Devils earlier in the three-game road trip. Unfortunately, despite the change in game-day routine, the result was identical and the Rangers beat the Stars 3-2, getting the game-winner with around two minutes left in regulation to send Dallas to a fifth straight defeat. Ruff juggled his lines a bit, putting Antoine Roussel, Cody Eakin and Ryan Garbutt together and the move paid big dividends as Eakin and Garbutt each had two-point nights (one goal, one assist each) and Roussel also played well, assisting on one of the goals. But in the end, it wasn’t enough for the Stars. "Yeah, I think the last few games we haven’t been at our best and we’re at our best when we’re on our feet, shooting the puck and making it hard on defense," Eakin said. "I think we did that tonight for the most part." The Blueshirts outshot the Stars 34-26, which isn’t a huge margin, but as Dallas’ veteran head coach so aptly put it in his postgame remarks to the press, really the only shot that mattered was the game-winner by New York’s Rick Nash with 1:58 remaining. "You get in a tight game like that and it’s being able to defend, it’s being able to take advantage of your offensive opportunities. We had some looks we could have got the deciding goal earlier in the period. We didn’t," Ruff said. "They didn’t have a lot of real good looks, but the last one they got went in." Stars No. 1 goaltender Kari Lehtonen was strong in net for the second straight night, stopping 31 of 34 shots. But once again, the talented Finn got no offensive support when he most sorely needed it. "I thought for a majority of the game, we played well enough to win. We took in some water at the end of the second and had some good chances in the third," Eakin said. "Kari (Lehtonen) was huge for us as always. Didn’t finish with the result we wanted." The Stars now return home and will likely have Saturday off before hosting the Islanders at American Airlines Center on Sunday, a game with a 5 PM puck drop. Of course, that’s the same Isles team that handed Dallas a 7-3 defeat on Monday to start off the three-game swing through the Big Apple on a sour note, so revenge will likely be on the Stars’ mind. But before his club can think about exacting a bit of revenge on the denizens of Long Island and end their season-long losing streak, their head coach knows several things need to happen. "On the bench, the guys are putting pressure on each other to take better care of the puck. As soon as you get peer pressure and guys are talking about making sure pucks are deep and taking care of the puck in some tough situations, we’ll start to win again," Ruff said. 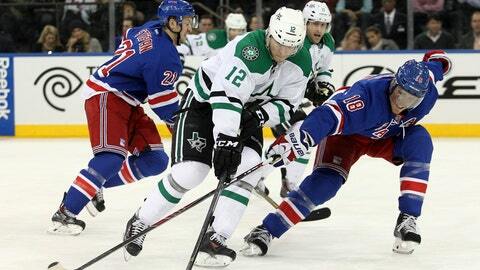 Sunday’s game marks the start of a three-game homestand for the Stars.